Home visiting helps parents get their children off to the best possible start in life. But right now, this highly needed service needs your support. At the end of March, federal funding for home visiting is set to expire without congressional action to extend the Maternal, Infant, and Early Childhood Home Visiting (MIECHV) program. MIECHV has allowed an additional 1,300 Washington families to receive home visiting services. Opportunities for positive change don’t come along every day. But right now, we have the historic opportunity to make a positive impact on the lives of children. Together, we can seize it. 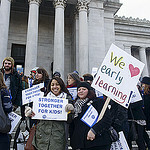 The New Year brings a new legislative session, with new challenges and new opportunities for Washington’s kids. In order to make sure kids are put at the center of government’s concern this year, it’s helpful to know who holds power, and how, in the State capitol. The fall 2014 elections resulted in a state Senate majority of 25 Republicans and a minority of 24 Democrats. In the House, a 51-member Democratic majority holds power, while Republicans hold the remaining 47 seats. Each elected representative works within the political party of his or her choice. Within the House and Senate, these parties meet as a unit. They are called caucuses. The caucus is a closed forum for discussing ideas and proposing action. One Senate Democrat, Sen. Tim Sheldon (D-Potlatch), chooses to meet in his Republican colleagues’ caucus. This is the Majority Coalition Caucus. During election season, the Children’s Alliance analyzes statewide ballot measures. Whether we support, oppose, or don’t get involved is based on the answer to one fundamental question: Is it good for kids and for racial equity? Today, we announce our opposition to Initiative 1351 concerning K-12 education. Every one of our state’s children needs an equal opportunity for high-quality early learning. That’s why a growing number of state, local and federal policymakers are supporting the first five years of a child’s life: the foundation for lifelong success. 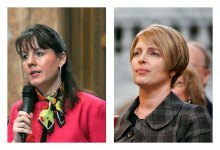 Among them are State Senators Ann Rivers (18th District, La Center, left) and Annette Cleveland (49th District, Vancouver, right). Children are born learning. Access to high quality early learning is critical to closing the gap for children who start out with fewer opportunities. An increasing number of lawmakers understand that early learning builds strong kids and strong communities. Last week the Early Learning Action Alliance recognized State Representative David Sawyer (Spanaway, 29th District) for his commitment to the first five years of a child’s life. 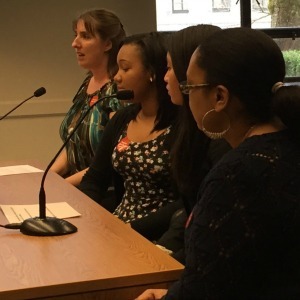 Today Children's Alliance joined with the Washington Low Income Housing Alliance and Columbia Legal Services to file an Amicus Curiae brief with the state Supreme Court in the McCleary v. Washington case. The brief requests that, as the state moves to comply with the Court’s ruling, it refrain from funding education in a way that jeopardizes housing and other basic services to children and families. The brief may be found here. While education must be fully funded, the brief explains how students in low-income families face barriers outside the classroom that limit their equal opportunity to obtain a basic education. These barriers also expand the educational opportunity gap that exists between white students and students of color. All kids deserve a chance to thrive. Thanks to the smart implementation of the Affordable Care Act here in Washington, we’re putting health care within reach of more children—so they can be part of a healthy future for all. Since the opening of our State’s new Health Insurance Marketplace, HealthPlanFinder, in October, more than 94,000 Washington children have been newly enrolled in Apple Health for Kids. An additional 5,000 children were connected with private insurance. What does that mean? Thanks to Apple Health for Kids and the Affordable Care Act, Washington has made tremendous progress toward the goal of universal coverage. What happens in the summertime to children who receive free or reduced-price school meals during the school year? Nationally, parents report that family food expenses increase by more than $300 per month when kids are not in school. For many low-income families, there simply isn’t enough stretch in the family budget to accommodate the increase. Summertime hunger contributes to summer learning loss; students who’ve experience hunger in the summer struggle to keep up in the fall. 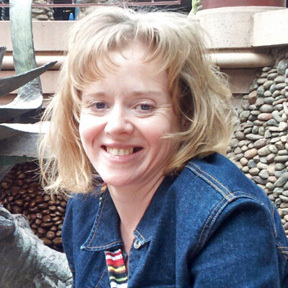 Seattle mom Dara Craven knows about summertime hunger firsthand. Dara, a Children’s Alliance member and child advocate, has struggled to provide healthy food for her two children during the summer months. Through a combination of growing a kitchen garden, using food banks and stretching her resources, Dara has managed to support her children. But she knows things can be better—that’s why she supports Senator Patty Murray’s Stop Child Summer Hunger Act, which would provide added resources for families with children during the summer months. When Jen’s youngest child, Caleb, was diagnosed with cerebral palsy, it not only changed Caleb’s life, but hers as well. Coming out of the doctor’s office, she remembers, “You get nothing—you’re just diagnosed.” All she got was a head full of unanswered questions. How would her two-year-old son live in the world? What kind of childhood would he have?